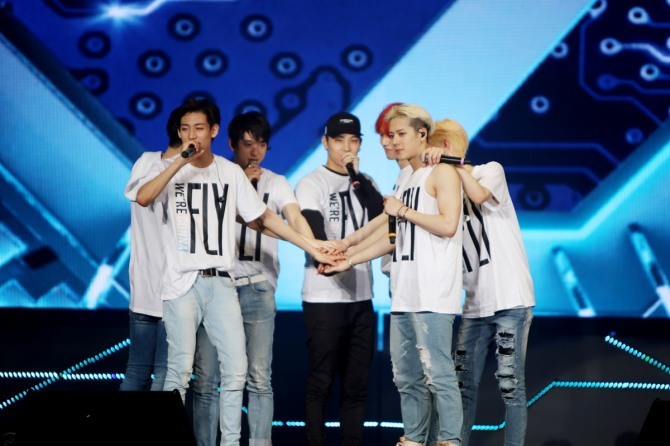 GOT7’s leader and vocalist JB made a surprise visit to the band’s first-ever exclusive two-day concert “Fly in Seoul” on Friday and Saturday. The visits on both days were made during the band’s encore stage. The 4,000-strong audience was excited seeing him, as JB announced Thursday the he would not be able to perform onstage due to his back injury. “The injury is not a big deal, so I will come back soon.” JB added. When asked whether the Saturday stage features JB in a press conference prior to the concert, however, members doubted it as he needs to relax. Before JB appeared, fans sang along his part, as members went on without replacing his part at the concert. One of the subunit songs from GOT7, “1:31 a.m.” was initially a duet ballad song by JB and Youngjae. With JB’s absence, Youngjae performed the song all by himself, bursting into tears as soon as it was over.